Sold by ✨Pick-N-💲ave❗ and Fulfilled by Amazon. Gift-wrap available. Sold by ✨Pick-N-💲ave❗ and ships from Amazon Fulfillment. Sold by IVORYGIFTSHOP and ships from Amazon Fulfillment. 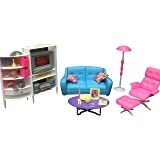 Living room with TV/DVD set & show case which can play with Barbie size doll and decorate in Barbie doll house. TV need 2 aa batteries that not included. Ordered on my husband account. A Christmas gift for my daughters and they loved it. You do have to put it together but my 9 yr old has no trouble. It fits 2 Barbie dolls. The reviews had me on the fence for a couple weeks. I really was prepared to see them unwrap a piece of crap but it wasn't. It's really pretty and fairly sturdy but we just super glued it all together anyways since my girls always lose pieces. 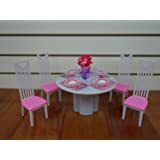 Perfect set to add to the Kidkraft Penelope Dollhouse, looks as if it came with it. 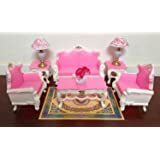 The quality is like Barbie brand furniture you buy so we are very happy with it. Plus, it's hard to find a set with all the cute accessories, like a plant in a vase, remote, laptop and picture frames. I'm an adult collector of miniatures, so I bought this set with the intention of painting each piece. I knew it was CHEAP BUT VERY CUTE when I bought it, so I had my hot glue gun and epoxy set up right next to my spray paints and palette/brushes. I repainted it all glossy white and pale pink - 1950s Americana style - and glued it tight. The bathtub gave me such fits, I actually ended up gluing AND caulking it. Please put this together and have it all glued before you give it to an excited child. 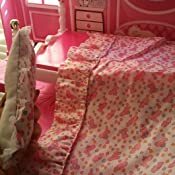 It is an adorable and affordable set, but it needs some help staying together. I have the original Barbie version of this set, and this one is just as cute really. The inserts for the coffee table are a little odd being they're of various kids toys like building blocks and what have you (the original Barbie version had seashells and sand for the inlays) and the legs of the coffee table required gluing for them to stay attached. The picture on the tv isn't the best, but that's a minor complaint. Overall a good set though. 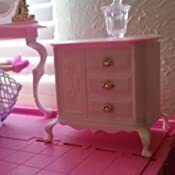 My husband built my granddaughter a Barbie House and I used this furniture to decorate the living room. 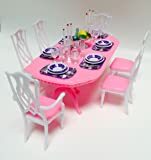 This is perfect for Barbies! And, much cheaper (cost) than anything with the "Barbie" label. It's functional and cute and my granddaughter loves the little accessories. For plastic, it's quite sturdy! Highly recommend! 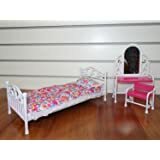 Bought a couple of these sets for my granddaughter's doll house. She's only 4, and I knew it would probably be destroyed in a short time, as she's pretty tough on her toys. And for that reason I didn't want to spend a lot of money. The products are total crap, which I expected considering the price. But she's having fun with it, and once she grows up and is a little more responsible, I'll get her more quality pieces. But, fair warning, its complete junk. You're gonna get what you pay for. Also, there are a lot of tiny little decorative pieces that we ended up throwing away, as there is also an inquisitive toddler in the house, and we didn't want any choking issues. Only reason I gave it 2 stars is because she's having fun (for now), otherwise a 1. Hope this helps. I am 100% satisfied with the quality, vibrant color, and the design of the product. 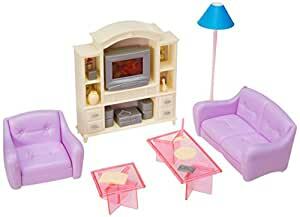 This modern design furniture gives Barbie merchandise/ Mattel a run for their money. 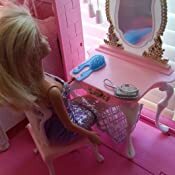 I was initially hesitant about purchasing non official Barbie merchandise for my niece for this up coming Christmas. 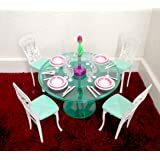 I always read reviews and the reviews on this item were mostly positive ( A thank You to all the take the time to write reviews) I am so glad that i made the purchase. I read the back of the outer carton and discovered that there will be more designs that are to be release. I will most definitely keep my eye out for them. 4.0 out of 5 starsCute. I should have opted for the cheaper set. Definitely look around for a cheaper bathroom set but it looks nice. I love that it’s not pink. I ended up using glue in some parts like sticking the mirror to the sink because it falls off every second. And the top of the toilet does not hold up to opening up and down.